Dehumidifiers are absolute lifesavers for a lot of people. Whether it’s reducing moisture and mold in the bathroom or keeping the oppressive humidity at bay during the summers, they’re an essential part of keeping many homes healthy and comfy. However, they take up an awful lot of space. It’s hard to find a way to fit a bulky dehumidifier in the bathroom in the first place, so you can see why so many folks go without. The best small dehumidifiers give you powerful performance in a compact package, so you can defeat your moisture problems without taking up all your living space. In this guide, we’ll introduce you to our favorite small dehumidifiers for dealing with tight living spaces. We’ve chosen a few different options to suit rooms of various sizes, but even the model we’ve recommended for large rooms is still going to save you quite a bit of space over the competition! This Ivation 11-pint model is currently the smallest dehumidifier we recommend, period! It’s seriously compact but can still compete with the big boys for performance. As long as you don’t expect it to do more than it’s rated to do, you’ll love it! You can use it for rooms as large as ~200 square feet. We don’t suggest pushing it to its limits, especially because it’s only rated for 11 pints of moisture removal at that scale. Still, it’s more than enough to handle a typical bathroom or a walk-in closet where moisture is an issue. We also suggest it for something like a guest bedroom, laundry room, or crawl-space. At 19.5″ x 10″ x 9.5″, it’s compact enough to fit anywhere you need moisture control but are super tight for space. We’re especially impressed by how reliable this thing is! For a company that haven’t been making dehumidifiers nearly as long as Danby or Honeywell, Ivation have created a stellar little workhouse in this model! Our compact recommendation to the average buyer is this Danby DDR-series dehumidifier. It’s an affordable, efficient little unit that’s easy to fit in basements, bedrooms, dens, and any other smaller spaces larger than the Ivation is rated to handle. We still wouldn’t use it for medium-sized spaces, but this is a more industrial solution for small spaces. It’s not all that much larger than the Ivation but it can remove nearly 3x the water in the same time period. Compared to other small, 30-pint models of the same price, it’s both more compact and more reliable. Plus, it’s not underpowered like the competition! The Danby Arctic Aire is our recommendation to those who want a compact solution for larger spaces. There are actually two different versions of the Arctic Aire available–one is a 30-pint model, and one is a heftier 70-pint model that’s the most compact we’ve found to handle larger living spaces. We’re recommending both models. The 30-pint is a more reliable alternative to the DDR-series for smaller spaces, and the 70-pint model is the best space-saving solution for medium-sized and larger spaces. Both are efficient, effective, and also refreshingly quiet. Which of these small dehumidifiers should you buy for your home? The Ivation is the obvious choice for the smallest spaces. It’s not something you should push beyond its limits or use for standard-size rooms, but it’s an absolute champ in tight spots like bathrooms, closets, etc. The Danby DDR-series is the better choice for standard-sized rooms and other smaller living spaces. It’s compact without compromising on performance or reliability. 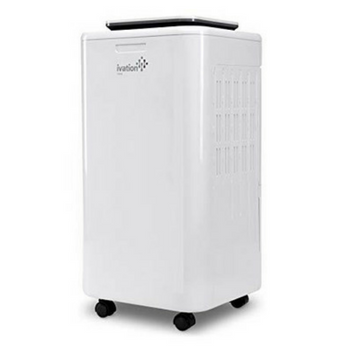 We recommend it to the average buyer looking for a small, high-quality dehumidifier. However, you really can’t push the space ratings. You should choose the Arctic Aire 70-pint model below for any medium-sized and larger spaces. If you want a compact model to handle a large amount of space, the Arctic Aire 70-pint model is the obvious choice. It’s smaller than most other 70-pint models and still performs just as well. The 30-pint model is also slightly larger than the Danby DDR-series, but it’s quieter and more reliable, so we recommend this one to anyone who can afford the difference in price. It’s challenging to choose the best small dehumidifier, however overall we’d recommend the Danby DDR series for average buyers for its strong performance and affordable price tag. While it’s tempting to simply buy the most compact and quiet dehumidifier you can find, you should never make any buying decisions without first establishing how much power you need from your new appliance. How many square feet do you need to dehumidify? How severe is your moisture problem? Choose the most compact option that can handle your space, not the smallest option period! Dehumidifiers of any size are far from reliable appliances. They don’t tend to have very long working lives, and while the pricier options may last a bit longer, the truth is they’re not usually any better made than the budget offerings. That’s why we always recommend opting for an extended warranty policy from a third-party provider, such as Square Trade. That way, no matter what happens, you’re protected for a reasonable amount of time. You’ll also have the added benefit of dealing with the warranty provider rather than the manufacturer. These manufacturers can be extremely frustrating to interact with, so it’s hard to overstate how nice it is to just make a Square Trade claim and avoid the ordeal. We’re confident that the models we’ve recommended in this guide are the smallest options that genuinely work well. However, if you’re going off-piste and considering other options, make sure you check dimensions carefully! Not every appliance that’s marketed as compact actually is. If you’re searching specifically for a small dehumidifier, chances are you have a set amount of space to devote to your new appliance. Check the measurements on any model you consider so you can be sure it’ll suit your needs! Hopefully, you’ve seen one or two compact dehumidifiers that could suit your needs. You can find out more about any of the models recommended above by clicking on the links in our reviews. Or, visit our homepage to find links to all our latest buying guides!